Soon after the Army Operational Shooting Competition(AOSC) 2018 in Bisley, the British Army is invited to compete at Canadian Armed Forces Small Arms Concentration (CAFSAC). CAFSAC is a world-class event that recognizes the world’s top military shots. From the Chief of the General Staff quote “we will once again send a selected group of marksmen from the field army to compete against the best of the international competition”. By representing the British army as part of the British Army Combat Shooting Team (BACST) in Canada, soldiers and officers develop vital military skills which aid their professional development and enhances the combat effectiveness of their units. We attended the selection phase which was 2 weeks in Warminster. The selection phase (30th July-10th August 2018) was not easy as we 26 shooters from across the army who were further down selected to 12 best shots on Exercise SHARPSHOOTER to compete in the CAFSAC. The competition was held at Connaught ranges, Ontario, Canada. We were extremely excited to be in Canada to represent the British Army team and team Great Britain (GB). We were informed that the Nations taking part including us were; US Army, US National Guard, US Air Force, Dutch Army and Marines, Australian Army, Canadian Army, Canadian Reserve, Royal Air Force (RAF) Canada and Canadian Rangers. No teams were less experienced than any other as they were the best selected shooters from across their armed forces and country. After training in the UK, we departed from London Heathrow on 3rd September for Ottawa lead by Lieutenant Kirkham (team captain) and Warrant Officer Class 2 Grierson (coach). We started our training in Ottawa Ranges for a couple of days before the competition. The competition took place from 12th – 22nd September 2018. Major-General Stephen Cadden (Commander Canadian Army), Lieutenant Colonel Peter St Denis (Director of the CAFSAC) addressed us on the opening ceremony on the 10th September 2018 wishing good luck to the participants. As there were around 350 competitors, the range days were slow compared to the UK and we hardly completed two shoots a day. During the match, we met so many people who praised our shooting skills and there were people enthused by the history of the Gurkhas. We got an opportunity to have conversations with competitive shooters from different countries with whom we shared our skills, techniques and knowledge of shooting. They were equally skilled and demonstrated interesting shooting techniques but we had to trust our own shooting skills and be confident with our weapon system. The most challenging part during the shoot was the weather which would take no time to change and would impact on our shooting. After a week, I was in third place overall behind two Canadian shooters, and was just nine points behind first place. There were just two matches remaining for the final of Stage two. Before Stage two started, there were international matches (17 and 18) where an eight-man team from the RAF, Army Reserve and Army were selected where I performed extremely well and finished just three points behind the first place. Team UK came top amongst 5 nations beating the second placed team by approx 90 points which was the best UK result in last 15 years. I managed to become the overall top shot through my shooting in the final match, overtaking all competitors. 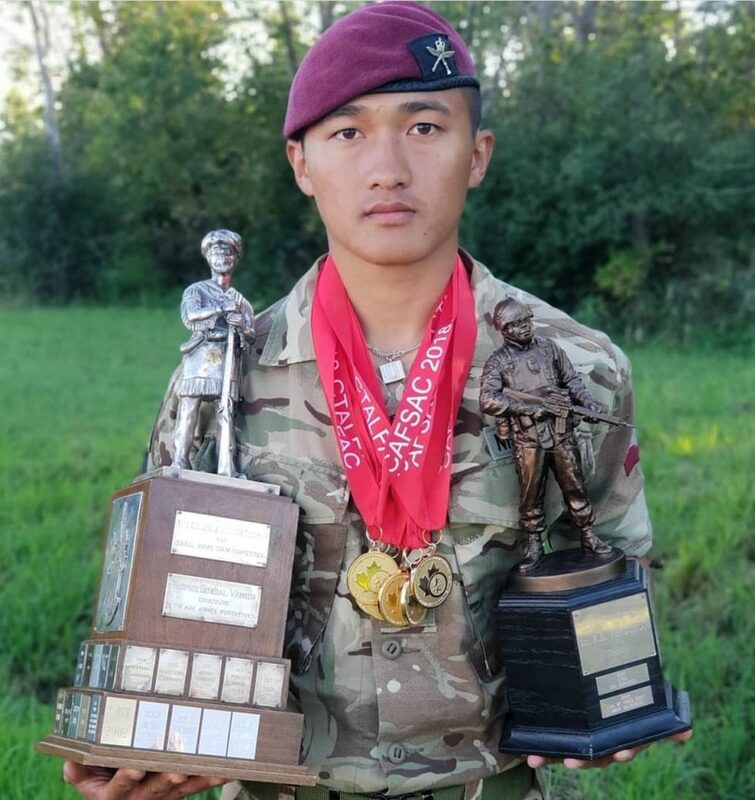 Rifleman Egget from our team came second, and Sergeant Yam (1 Royal Gurkha Rifles) came 20th overall. Everyone in the team was extremely supportive and was incredibly proud of the results we achieved. 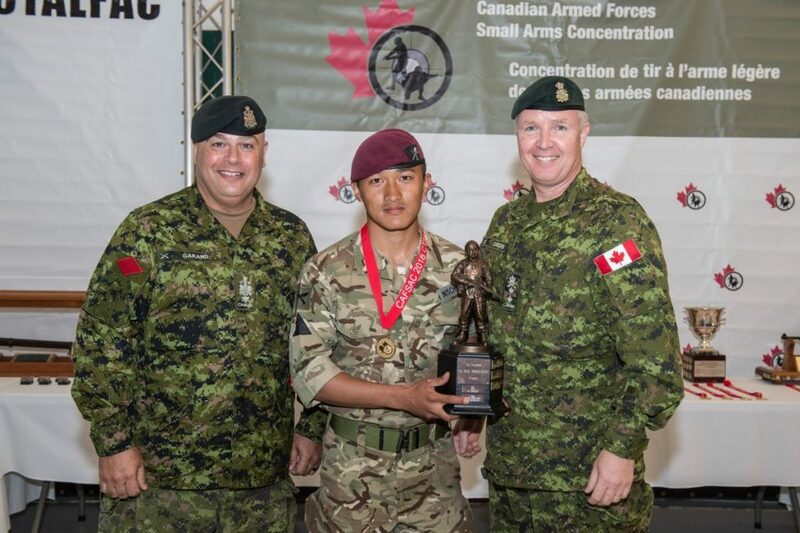 It was a tremendous honor to receive the top shot trophy (Lieutenant K Ferguson Trophy) from Major General Stephen Cadden, Commander of the Canadian Army. It would have never been possible without the support of my platoon, company and the battalion and the bond we shared between our team. On 26th September 2018, we departed Ottawa for return home. It was one of the most precious and proud moments for us to be welcomed by Commanding Officer, Gurkha Major and Regimental Sergeant Major Sahebs’ along with all senior Gurujis’ in our Battalion with Khadas.